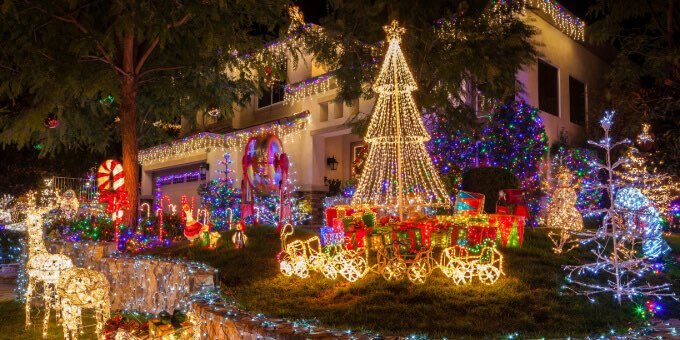 Are you ready to have the best Christmas lights show around? The time of traditions has arrived! Putting up the tree, baking Christmas cookies, wrapping presents, and of course trying to have the best Christmas lights on the block. This is your year too. There’s no way Roger and Tammy down at 1305 are going to outdo you this year. And we’re more than happy to give away our secrets to help make your house the one that everybody stares at this Christmas season. If you’re after the best light show on the block, you have to dare to be different. Your standard icicle lights and yard reindeer are perfectly festive, but you need eye-catchers this year. One of the more popular light displays in the Raleigh, North Carolina area (our hometown) features a tank. This man put a full-fledged army tank in his yard and decorated it with lights. We aren’t even kidding. It’s awesome. Now you don’t have to go purchase a military assault vehicle and put it in your front yard, but adding some elements to your light display that aren’t found at the house next door can really amp up your presentation. One of our personal favorite ideas includes synchronizing your light show with music (this can be easy if you purchase pre-programmed lights, or quite extensive work if you want to sync the lights on your own). Fiber optic lights also look really cool and aren’t all that common. They’ll also save you a lot of money on the Christmas light energy bill. If you really want to go big, you’ve got to get started early. A really well-done light display has a lot more to it than a sheer mass of lights and ornaments. Planning ahead is the only to get all the items you need and organize them appropriately on your yard and house. Many of the houses that have now become nationally famous for their light displays begin the process as early as August every year. You don’t need to start that early unless you’re really gunning for the national news, but consider planning your display around the start of November (at least for next year). That will give you enough time to decide on any themes or unique things you need to get before setting it all up. That much time may seem like overkill, and it totally is. Overkill is the whole point of excessive holiday light displays. You don’t need a theme to have a nice looking house, but it can add dimension to your light show when done well. It doesn’t have to be overly specific to be awesome either. Using all white lights is an incredibly simple theme that, if arranged correctly, could win the entire block. Using lights and lawn ornaments to create a scene, such as a Santa scene or something historical, is a personal favorite of ours. Roger and Tammy aren’t going to know what hit them this year now that you have FilterEasy on your side. So bring the unique ideas and go big. Send us your rockin’ displays this year, and we’d love to share them! After graduating from NC State, I joined FilterEasy in the summer of 2018. I have always loved writing and enjoy blogging on subjects that are important to families and homeowners. Outside of work, I love to fish and am a huge college sports fan. Ways to Spend "Me Time"
Taking 15-minute breaks throughout the day can help you be more productive and less stressed. Here are a few creative ideas of how to spend that time. Weatherstripping your home can be more complex than you might think, as there are tons of different types of weatherstripping. Let us make it simple. Snow is fun, but it can also be dangerous and extremely inconvenient. Here's a few things you'll need to make it more manageable.